This book is pre-release, please check back often as I will give an update once it is released. You can find out more about the author on her website and twitter. What matters most - love or power? Richard, intent on staging a triumphant return to provincial politics with his wife and children at his side, refuses to give up Natalie so easily; and Daniel, used to subsuming his own interests to those of his twin, must decide if he is willing to fight for the woman he wants. When people dying from a potentially new and virulent form of influenza arrive seeking help, Natalie, Richard, and Daniel must each map the boundaries of their own loyalties and morality. 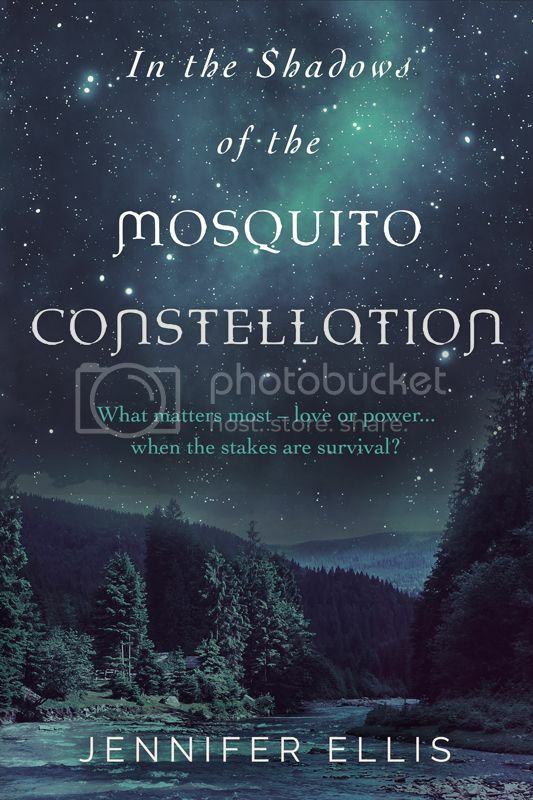 In the Shadows of the Mosquito Constellation is a story of adventure, politics, and love in a brave new world where the old rules don’t always apply. Despite starting in two scenes of life or death this book instantly had emotive writing, clueing you in to who was who and bringing the night and the inferno out of the pages. The switch from the first danger of a fire, to the second of arrows was smooth, giving little away about the reason. During the first chapter, if you had not read the blurb, you would have believed you were reading a wild west farming novel. This worked to the book's advantage, allowing you to meet the cast and get an emotional grip before learning the back catalogue of how this happened. Throughout the entire book it flipped seamlessly between diverse farm life, life of death battles and romance. I liked that despite this novel being post-Apocalyptic for once there weren't humans walking around rotting on every corner. This was very much a more realistic and refreshing change, covering how oil ran out and caused economic collapse. This is explained well and believably, but without spending half the novel in flashbacks. It very much lives in the present, galloping from one event to the next. The characters were well written, many with an instant like or dislike for the reader. For example, Richard, the owner of the farm comes off as instantly brash, especially as he argues with his wife, him doing nothing, while she tries to stop their crops burning to the ground. It shows a lovely power uncertainty between the couple, both fighting to run the farm their own way. As Richard left that scene one of the gems of the writing shows up, "Natalie’s wedding ring sears her finger like a brand". …And then Richard's brother shows up on the scene. Cue the fireworks! I did find it hard to keep some of the farm members straight as to who was who and who was the mother-in-law, for example. I think that is a natural hazard of having such a large cast as you would need to run a farm with minimal electric or fuel, but when somebody we haven't seen for a few chapters casts a main character a dirty look then stalks out I would have liked a quick thought to somehow let me know who I was dealing with.